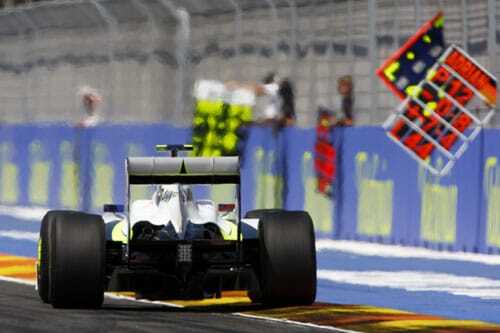 Rubens Barrichello took his first win for five years, leading Brawn GP back to the top of the pack at Valencia, Button could only manage seventh place but still managed to increase his championship lead. Barrichello drove a superb race and took the lead from Lewis Hamilton after McLaren bodged his pit stop when they failed to have new tyres ready as the reigning champion came in for his scheduled stop. “What a fantastic day. I am so delighted with the win after what was a really tough race out there. It’s just amazing and a weekend that I will never forget. Even after five years, you don’t forget how to win and the feeling is so good! Although we were fuelled heavier than the McLarens, I knew that I would have to push really hard throughout the race.” Said Barrichello. Jenson button goes into the Belgian Grand Prix with 72 points, eighteen points ahead of team-mate Rubens Barrichello. Brawn lead Red Bull with 126 points to 98.5.